‘Distinction’ is defined by the Oxford English dictionary as “excellence that sets someone or something apart from others”. Dubai defines it as the Ritz-Carlton Dubai International Financial Centre. A bold statement in a city/emirate over-flowing with hotels, all promising ‘luxury’, a term which has become the most homogenised word in tourism. So how does a property in the one of the global capitals of ‘bling’ approach setting itself apart from the madding crowd? Quite simply it forgets the rest and focuses on its own standards of refinement and service to make a stay under its roof a memorable experience. From the outside this stunning venue seems more at home in a New York or Chicago skyline, but equally sits well within the growing sophistication of Dubai’s financial district which is a maturing as a hub for culture and dining. As you walk into the warm marble of the lobby you feel welcome, the design grand, but yet not austere. The soft tones and elegant furnishings evoke a sense of style and substance, this is not death by crystals or overkill on opulence this is a hotel purposefully created to put one at ease. The warm smiles of the staff are convincing, less forced familiarity and more genuine hospitality than many Dubai hotels. Here you are don’t receive the mass market greeting of ‘Mam, sir’, rather the ‘ah Mr Armstrong, delighted you could join us’ as if you are an old friend returning for a visit after too long away. If you book a Club Level room, thoroughly recommended, you are taken to the plush executive lounge where you enjoy a welcome drink as all the check-in formalities are effortlessly taken care of. You chat with the affable Director of Rooms Kevin Song (cool guy according to my teenage boy) while your bags are whisked away, deepening the sense of hospitality, and you haven’t even reached your room yet. Opting for the Ambassador Suite affords you the opportunity to let your jaw drop a little, while ‘wow’ seems too cheap a word, it neatly describes the ‘walk-through the door’ experience. 1,400 sq ft of space is luxuriously divided into an entry lobby leading to a spacious lounge & dining area, where wall-to-ceiling windows add more space and light, looking out on a grand balcony and out further to the DIFC. Off the entrance lobby is the master bedroom, here the king-sized bed with feather beds and down comforter with duvet, and 400 thread-count Egyptian cotton linens, promise a good night’s rest. The marble bathroom, with bath and monsoon rain shower providing invigoration on demand, creates that personal spa experience. This hotel has perhaps unfairly been labeled as a business property. Situated in the sophisticated heart of the DIFC it’s easy to see why some have made the assumption, and it is without question an excellent place for work meetings, but this place has so much more to offer to the leisure traveller. Summer always focuses the mind on travel so firstly its location just 15 minutes from Dubai International Airport makes it the ideal staging platform for a journey away or relaxing when you are returning from a trip. But, with the emirate’s shopping malls offering Ramadan and Eid discounts galore, the fact it is five minutes away from Dubai Mall (and the Burj Khalifa) provides the perfect excuse for a retail-inspired UAE staycation. The hotel’s most memorable dining option, for this traveller at least, was perhaps Café Belge, which ‘celebrates the vibrant spirit of 1920s Brussels’. It’s an eatery that oozes charm and easy sophistication. A lively evening crowd come for the jazz as much as the excellent food, a place where suits and ties sit comfortably next to hipsters. It’s all rather cool in a Downton Abbey-esque way – or Downtown Abbey if you like. However, if you want to escape the noise and indulge in some quiet time, returning to the executive lounge is a great option. No ‘happy hours’ here just food and beverages available all day in sumptuous surroundings, your needs waited on by the attentive (but not overly so) staff. Featuring its own kitchen and chef it also serves up delicious surprises so that no single visit is the same as the last. The tone of the lounge it set by its director, the immensely likable Dara, who is competence and conviviality perfectly blended. Easy charm mixing with absolutely apparent ability, in many ways he reflects what makes Ritz-Carlton stand out in the crowd. While you know this hotel works tirelessly to make your stay memorable it never seems to be trying too hard, probably because it has hand-picked a team who know precisely what they are doing. The end result is a stay that is practically effortless for the visitor, where the science of stress-free has become an art. With the summer of staycations the Ritz-Carlton DIFC has prepared a surprise for those visiting with smaller, but equally important, guests. The ‘Family Fun’ package offers guests the chance to reserve a three nights’ hotel stay and pay for just two nights in a Deluxe Room, Premier Room, Junior Suite or Executive Suite, with the option of a connecting room and suite for those traveling with young children. 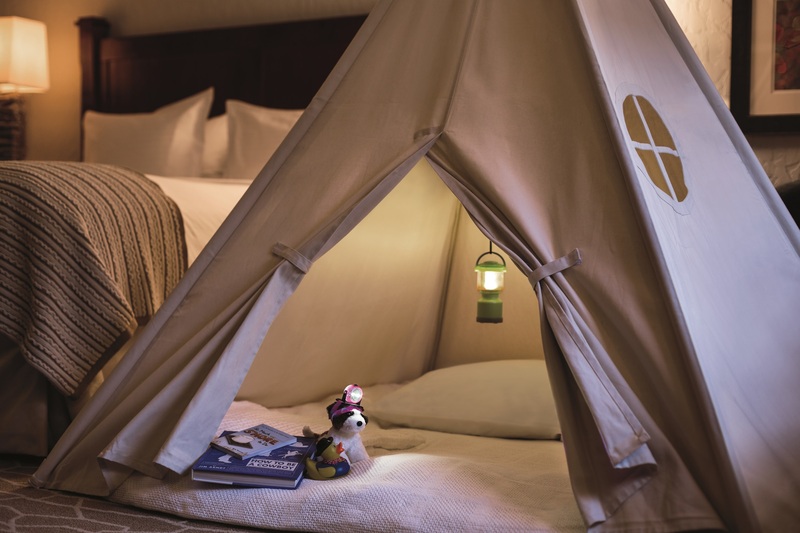 Ritz Kids can discover a sense of adventure, with the option to sleep in a fun teepee tent complete with Ritz-Carlton linen, designed to capture the imagination of any young explorer. Families who reserve the package will also receive complimentary tickets to Modhesh World, the indoor theme park hosted at Dubai World Trade Centre, as well as a VIP tour and meet and greet experience with Modhesh himself. Next Post Can four stars feel like five in Abu Dhabi?